Daniel House spent time with Vikings tight end Rhett Ellison and found out more about how he is transitioning to his new role in the Vikings offense. 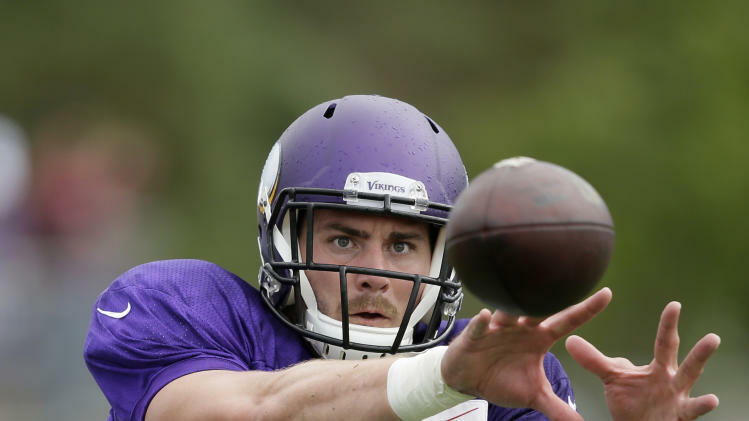 Tight end Rhett Ellison has been one of men who has paved the way for Adrian Peterson over the last two seasons. This year, a new coaching staff entered the fold and Ellison was designated as a tight end, making the switch from the fullback position. He was even awarded a new number to reflect this change and will see more passes in Norv Turner's offense this season. Rhett is one of the only solid options at tight end behind Kyle Rudolph at this point. Ellison is entering his third season with the Minnesota Vikings, after being selected in the fourth round of the 2012 NFL Draft. Ellison is looking forward to this season and actually enjoys the work that comes along with training camp. "It's always a lot of fun. I actually enjoy camp because it is kind of a no distractions, just a focus on football type of thing," Ellison said. Ellison is learning a new playbook from offensive coordinator Norv Turner and feels that this alone, will help the Vikings be successful this season. Rhett believes the attention to detail now, will pay dividends when the regular season rolls around next month. "It's awesome because there's just so many details and there's so much attention to detail in this offense, that it really puts you on the spot every time you are on the field and it's effective against every kind of look you can get, so we just need to get those little things right in camp and we should be good to go," Ellison explained. Ellison is making the transition to playing more tight end in this offensive scheme, but he continues to see some action at the fullback position. He isn't sure what direction the coaches will pull him in the offense, but he is ready to seize the opportunity and make the most of it. "It's good [playing more tight end]. I'm just kind of going wherever they want me to go right now. I'm still doing some fullback and all sorts of stuff, but whatever there plan is, I'm just kind of trying to figure it out," Ellison added. Ellison is enjoying the chance to play under head coach Mike Zimmer and likes the fact you have to earn his respect every day you set foot on the field. "It's all business with him and you have to earn his respect every single day. It's definitely something you can see everyday," Ellison concluded.